One of the most challenging weeds in the Mary Snoddy garden is spotted spurge. This heat-loving member of the Euphorbia family is also known as prostrate spurge for its mat-like habit of growing flat against the ground. Native to the eastern half of the US, spotted spurge is an annual weed with a taproot. “Annual” means it sprouts, blooms and sets seeds in one season. The mother plant will die with cold weather, but she will leave behind lots of seeds for future seasons. The leaves are tiny (½ inch or less) with a small burgundy splotch, hence the name “spotted” spurge. Stems are pinkish to burgundy. Tiny pink flowers form along all stems. The stems can root wherever they touch soil. Plants thrive in any type of soil and even sprout between bricks and in concrete cracks. 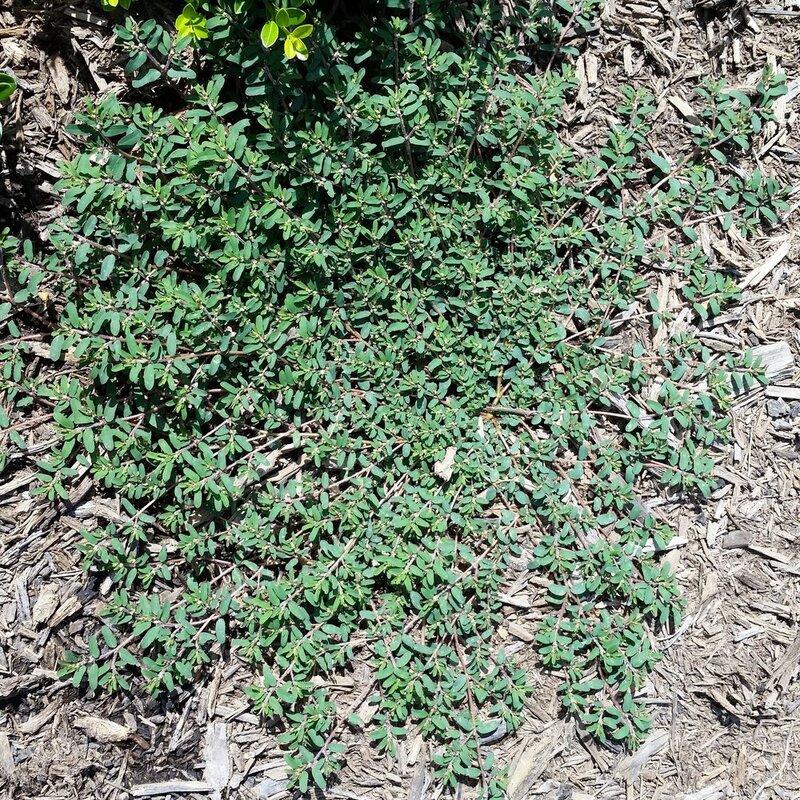 Spotted spurge goes from flower to seed in four weeks or less, which means it will rapidly spread across your garden and lawn if not removed or killed via chemical means. There are several choices for pre-emergent or post-emergent control. Despite its miniature leaf size, spotted spurge is considered a broadleaf weed. Be sure to read the label to confirm that any herbicide you purchase is effective against this pest. Herbicides are most effective when the plants are young (spring and early summer). They develop a resistance with maturity. Because the weeds are so easily seen, I usually just pull mine by hand rather than use a chemical control method. The milky sap common to all Euphorbias can irritate skin, so I always wear my favorite disposable gloves (5mil nitrile) for weed-pulling duty. They grow FAST. I have seen a seedling go from two inches to three feet in a week. Purge them while they are young!